The innovative ways marketers are using audio to send powerful messages around the world. In the world of marketing, there continues to be much inventive and creative use of sound. While radio is the toughest medium to write for in the advertising business, it is also the most creatively freeing. And as with other mediums, radio is being reinvented with the wonders of digital technology and advertising agencies are not even confining their audio ideas to radios any more. According to the South African Medical Research Council in 2017, 40 per cent of South African men assault their partners daily. Five times higher than the global average. Research also revealed this number spikes dramatically after soccer games. Alcohol was the number one excuse. Carling Black Label, the best-selling male beer brand in South Africa, recognized the need to acknowledge the link between men who abuse alcohol and men who abuse women. It wanted to use its status as a masculine brand to promote a "No Excuse" message to the largest audience of men possible. To do that, Carling leveraged its sponsorship of the biggest soccer event of the season. Carling recruited a diverse and accomplished choir of women. These women had also been victims of abuse. On game day, the FNB Stadium in Johannesburg was filled with 85,000 people – mostly men. Millions more watched on television. This all-female choir walked onto the field before the soccer match to sing "Asambe Nono" – the famous South African football song. As with every soccer game, the stadium of 85,000 sang along. "Never again. What excuse will he give if this ends in a fight." Over 80,000 men in the crowd slowly stopped singing, looked around puzzled, then, looked up at the screen. The song ended with the words "Real men don't act this way." The jumbo screen said: "No Excuse for Abuse." 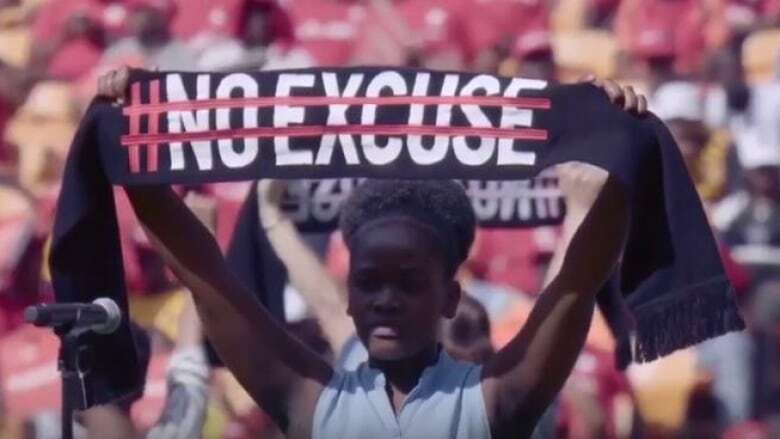 Carling had hijacked the country's most famous soccer anthem to promote a "No Excuse" message to an audience of 45 million. The unexpected song intervention generated over $30M in press mentions and ignited a critical conversation on a massive scale. An innovative use of audio - created by Carling's advertising agency. It was a "Soccer Song For Change." In a growing number of countries, censorship is not only present, but increasing. People are not able to access independent blogs and news sites, denying them their right to free information. That prompted an advertising agency in Germany to work with an organization called Reporters Without Borders. The ad agency collaborated with five acclaimed independent journalists from five countries suffering from strict government censorship. They took the articles that had been banned or censored and turned them into songs. Working closely with the journalists, the composers stayed true to the original text. They traveled to the oppressed countries to absorb the local music and feel the oppression first-hand. They said it was intimidating - but the trips inspired harmonies and melodies. They learned about traditional instruments and teamed up with local musicians. From that - 10 banned articles were turned into 20 music tracks in multiple languages. The music tracks were compiled into a playlist and placed on the top music streaming services - like Spotify, Deezer and Apple Music. While press freedom is not available in the world's most oppressed societies, global music streaming sites are. This digital loophole allowed the journalist's articles to quietly pass through the censorship disguised as music. It was a remarkable way to get vital information out to the people. And you can listen to these remarkable songs via your favourite music streaming service or on YouTube by searching: "The Uncensored Playlist." Over in Romania, there are no helmet laws for cyclists. As a result, accidents there have tripled over the last six years. 46 per cent of those accidents involved cyclists wearing earphones. So an advertising agency in the Romanian capital of Bucharest teamed up with the top national radio station to create a radio campaign promoting safe cycling. The theme was: Go Mono. The goal was to continue entertaining the radio station's listeners while keeping them safe at the same time by asking cyclists to listen with only one earphone so they could still hear the traffic. First, famous Romanian recording artist Claudia Pavel released a new song urging cyclists to listen using only one earphone. In other words, to "Go Mono." Pavel did two alternative mixes for her song. In the left earphone was a rock version. In the right earphone, an acoustic version. To kick off the campaign, station Radio 21 used innovative radio technology to air their #1 national morning show out of one speaker. "Go Mono" jingles were created to remind listeners to keep one earphone out while in traffic. Then a heavy rotation of 31 top Romanian recording artists joined the cause. These artists remixed their songs in mono. The winner from the television show X-Factor created the first song that could onlybe listened to in one earphone. A campaign logo was created showing a cyclist with one headphone hanging loose. "Go Mono" safety messages went viral on social media. Outdoor posters, billboards and print ads were put out urging cyclists to "Give mono a chance." Even the Romanian police endorsed the campaign. In the end - using radio creativity - over 3.5 million people were reached with the "Go Mono" safety campaign. Proving you can even save a life with a sound idea. For more innovations in sound, click or tap the "Listen" tab above to hear the full Under the Influence episode. You can also find us on the CBC Radio app or subscribe to our Podcast.